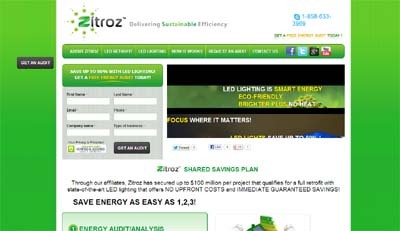 It offers energy saving LED lighting systems to save on energy bills. It upgrades facilities with state-of-the-art LED technology with No Cost Up Front and guarantees immediate savings on current utility bills. It delivers energy saving solutions in just 3 simple steps namely energy audit, design retrofit and schedule installation. It upgrades facilities with state-of-the-art LED technology with No Cost Up Front and guarantees immediate savings up to 80% on energy bills. It offers energy saving solutions in just three simple steps namely energy audit, design retrofit and schedule installation. Its Shared Savings Plan lets both small and large-scale companies to save on energy costs, run on state of the art LED lights and reduce greenhouse emissions effectively.